THRONES - Their Spiritual Perfection WILL Affect You! The Thrones (Gr. thronos) are a class of celestial beings mentioned by Paul of Tarsus in Colossians 1:16 (New Testament) and related to the throne of God the Father. They are also the Third Order or Choir in the First Hierarchal Sphere of the Hierarchy of Angels and part of the Heavenly Couselors according to Dionysius the Areopagite. They are living symbols of God's justice and authority and are the closest of all Angels to spiritual perfection. Despite their greatness, the Thrones are intensely humble, an attribute that allows them to dispense justice with perfect objectivity and without fear of pride or ambition. 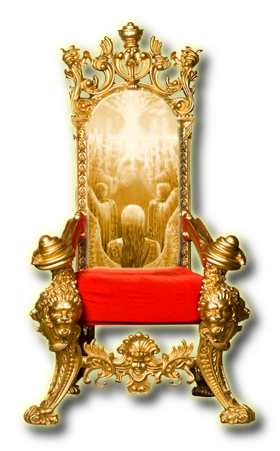 As they are living symbols of God's justice and authority, they are called Thrones and have as one of their symbols the throne. These high celestial beings are mentioned again in Revelation 11:16 and were considered Angels of Justice as they were said to carry out God's decisions. These Angels were often believed to be deployed like charioteers around the Throne of God. Sparkling Like the Colour of Burnished Brass. Because of their high rank, they are worthy of fellowship with Jesus the Christ and possess the highest knowledge that angels can have of the works of God. In fact, some say that the very essence of God's Spirit is conveyed to and through these angels, who then pass on the message to men and/or lower classes of angels. The Thrones may possibly be equated with the Lords of Wisdom, a Hierarchy of Elohim astrologically associated to Virgo, presented in The Rosicrucian Cosmo-Conception. They inhabit, in Rosicrucian cosmology, the World of Divine Spirit, which is the home of The Father. According to this source, the Lords of Wisdom (here equated with the Thrones) and the higher Lords of the Flame (Thrones / Wheels: Ophanim) have worked together in a far past toward the development of mankind.